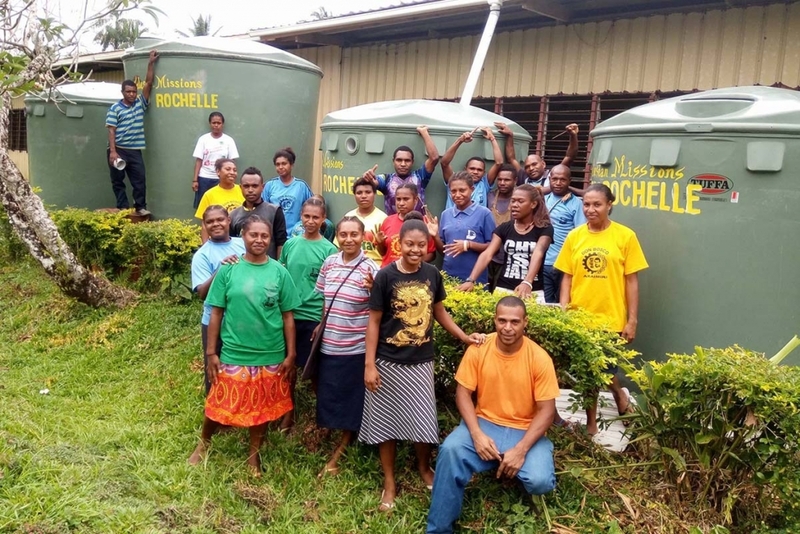 (MissionNewswire) As part of its Clean Water Initiative, Salesian Missions recently donated eight water reservoir tanks to the Don Bosco Araimiri Secondary School in Araimiri, Papua New Guinea. The school is located in a remote area without access to even the most basic necessities. The new water tanks give students access to clean drinking water. Prior to receiving the water tanks students would need to draw on unsafe sources for water, which were often the cause of health-related epidemics, especially during periods of drought. The Salesian mission of Araimiri was launched in 1980 by Father Valeriano Barbero, Father Rolando Fernandez and Salesian coadjutor Joseph Kramar. Currently, the school educates 250 students. Secondary education provides youth the foundation for later vocational and technical education youth need to find and retain stable employment. Education helps youth break the cycle of poverty and become contributing members of their communities. UN-Water estimates that worldwide there are more than 663 million people living without a safe water supply close to their home and must spend countless hours queuing or trekking to distant sources to look for water and cope with the health impacts of using contaminated water. For those who have no access to clean water, water-related disease is common with more than 840,000 people dying each year from water-related diseases. Women and children often bear the primary responsibility for water collection in the majority of households globally and spend 140 million hours a day collecting water. Children in these communities are forced to walk for hours to collect drinking water—water that often proves contaminated and seriously sickens those who consume it. Many others are unable to attend school regularly because they must spend time searching for distant wells. In response to this crisis, Salesian Missions, the U.S. development arm of the Salesians of Don Bosco, has made building wells and supplying fresh, clean water a top priority for every community in every country in which Salesian missionaries work. Having access to basic needs like water and sanitation in schools and within local communities is important in a country where 28 percent of the population lives below the poverty line. Close to 50 percent of adults are illiterate and 25 percent of children are unable to attend school. Part of the problem with getting to school, work and hospitals has to do with Papua New Guinea’s infrastructure. In rural areas, where nearly 88 percent of the population resides, there are few roads or means of transportation to get to schools or places of employment. Salesian missionaries in the country provide primary and secondary education as well as technical skills training to prepare youth for the workforce. Missionaries also help to ensure that basic needs like shelter, food and water are met so students are able to focus on their studies.